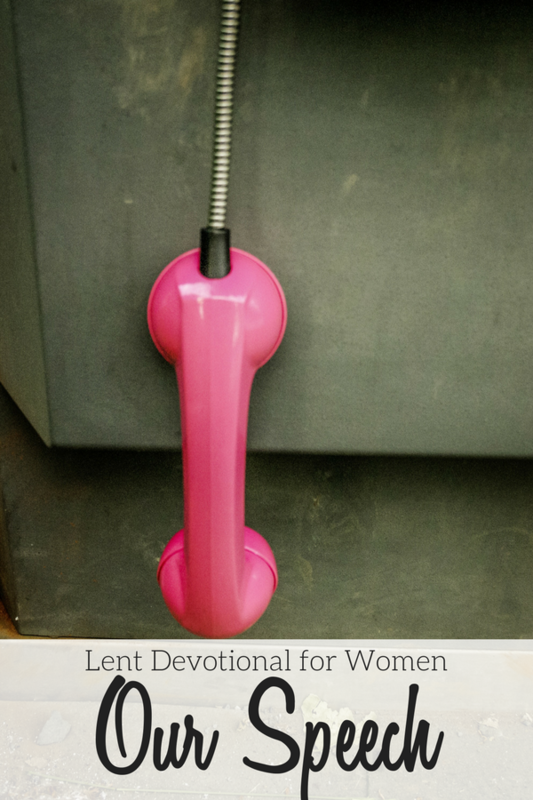 This Lent Devotional for Women will consider what we say, how we say it, and who we say it to and we’re looking at Peter the Apostle to get us started. Keep this in mind as we go through this; our speech reveals who we are. Maybe it’s the way we talk, the tone or inflection that gives us away. Maybe it’s the local slang or words that would hint at our age. Maybe the force, volume, or speed; either way, our speech reveals who we are. (ASV) …for thy speech maketh thee known. (BBE) Truly you are one of them; because your talk is witness against you. (CEB) The way you talk gives you away. (ESV) Certainly, you too are one of them, for your accent betrays you. (GNT) After all, the way you speak gives you away! (NASB) Surely you too are one of them; for even the way you talk gives you away. (NLT) You must be one of them; we can tell by your Galilean accent. (DR) Surely thou also art one of them. For even thy speech doth discover thee. The above verses are a little varied but all have one thing in common, Peter was identified as a disciple of Christ by his speech. Does our speech, from the very first moment we wake up until the end of the day when we crash in bed, reveal Who we profess to follow, love, and imitate? You know, since we call ourselves “Christians” and all? What is the first thing we say in the morning? Before we open our eyes, slide out from under the covers, hit the floor? What do we say? I don’t want to do today. And then on to the next words, we speak or think. Maybe when we’re brushing our teeth or making the coffee. What do we say? Do we growl to ourselves or at others? Do we say things like, “Why are you so fat, tired, slow, etc” Do we look at the people around us and go through that same litany, only with them instead of ourselves? It wasn’t enough, or at least it hadn’t been enough for Peter to merely deny Christ, now he had to curse and swear to “prove” his disassociation. You know it’s coming…how or what do we do to prove we’re still cool, fun, or whatever, even though we’re a Christian. And let me tell y’all, I am not pointing any fingers because you know the saying about pointing fingers, three more are pointing back. I am accusing myself, not you. I’m not sure many of us have the chance to outright deny, “I don’t know Him!” But how often do we slip into laughing at crude jokes? Singing raunchy lyrics? Taking our Lord’s name in vain? Cursing or swearing, even if it’s only repeating a story, song, or movie? How often do we try to disassociate ourselves from being one of those religious fanatics by trying to blend in with the conversation with what we say and how we say it? So what can we do here? The very thing I would do is find Scriptures that deal with our words. There are so many! As a matter of fact, finding Scriptures about my thoughts and words was my introduction to Bible journaling or verse mapping. I used a gree n highlighter in the beginning because I associate green with life and I wanted my words–to myself and others–to speak life. What Does the Bible Say About Our Words? 1. Does this need to be said? 3. Does this need to be said right now? Might be something to think about today. Thank You Jenny!! I enjoy reading your post so….much…..! Have a Wonderful Holy Week and Easter Season! !